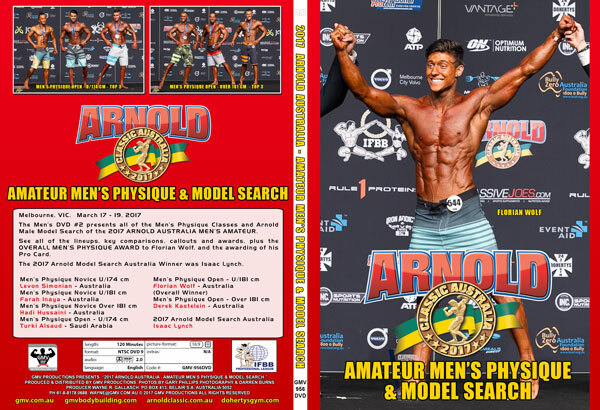 See all of the Classes of MEN’S PHYSIQUE – Novice and Open, plus the ARNOLD MODEL SEARCH AUSTRALIA – MALE MODELS. Plus the Overall of the Men’s Physique and the awarding of Pro Cards. 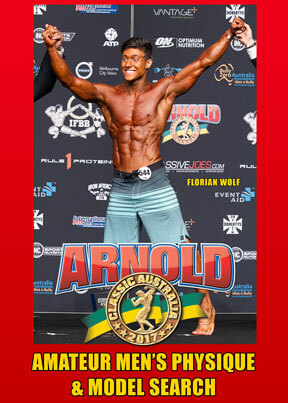 The Men’s DVD #2 presents all of the Men’s Physique Classes and Arnold Male Model Search of the 2017 ARNOLD AUSTRALIA MEN’S AMATEUR. See all of the lineups, key comparisons, callouts and awards, plus the OVERALL MEN’S PHYSIQUE AWARD to Florian Wolf, and the awarding of his Pro Card. The 2017 Arnold Model Search Australia Winner was Isaac Lynch. If you prefer, you can purchase any CLASS as an edited Video File sent to you by our free video transfer service. A Video File includes the complete class through to the awards. If you are ordering as a class winner in an overall posedown this will also be included in your file. 2017 Arnold Amateur Australia – Men’s Physique Results as seen in this DVD including Arnold Men’s Model Search.